1597565253 -This textbook, now in its third edition, is ideal for graduate dysphagia courses in speech-language pathology programs. The unique value of this book is the multidisciplinary approach it presents. Too often, speech-language pathologists function clinically with insufficient interaction with, or understanding of, the roles of other professionals involved with their patients. This text incorporates information pertinent to the roles, tools, and views of a multidisciplinary dysphagia team, including physicians, speech pathologists, nurse specialists, and dieticians, that works together on a daily basis. For the third edition, the authors have added a companion workbook that includes practical exercises accompanying each chapterfor example, a step-by-step tutorial for making objective measures of timing and displacement from fluoroscopic swallow studies. The exercises are designed to clarify and expand on information presented in the text and should be of interest not only to students but to practicing clinicians hoping to add new skills to their repertoires. The book comes with a DVD that includes an animated tutorial demonstrating techniques for objective measures from fluoroscopy studies. In addition, it includes both normal and patient fluoroscopy studies for review and measurement. The patient studies selected are representative of impairments typically observed in clinical practice (inpatient and outpatient). Other media clips illustrate each instrumental assessment technique introduced in the book (e.g., endoscopic, transnasal esophagoscopy, high resolution manometry), performed on a variety of dysphagic patients. As noted, a separate workbook is also available to reinforce student learning of the concepts presented in the textbook and DVD. 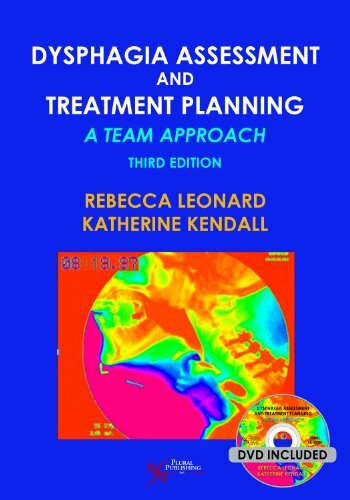 With its updated and expanded content, Dysphagia Assessment and Treatment Planning, Third Edition highlights the most current evidence-based research as it applies to a team-based approach to clinical practice.